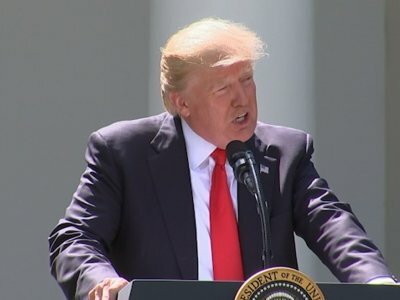 WASHINGTON (AP) — President Donald Trump’s decision to pull out of the landmark Paris climate accord sends an unmistakable message to the world: America First can mean America Alone. Trump’s move, announced with great fanfare in the White House Rose Garden on Thursday, immediately leaves the United States isolated on a paramount global concern. It demonstrates the U.S. is willing to back away from a coalition it assembled just 18 months ago. Nearly 200 countries joined the landmark deal forged under Trump’s predecessor. Now the U.S. stands with only Syria and Nicaragua as countries on the sidelines. Nicaragua balked because it found the deal’s standards insufficient. It’s a bitter blow to stalwart European partners who launched an aggressive campaign to convince Trump that American leadership is central to combatting climate change. Even a direct appeal from the Vatican wasn’t enough to persuade the president. For anxious allies, Trump’s rejection of the Paris pact is particularly jarring in the wake of his first international trip last week. Standing in the heart of Europe, Trump publicly lectured NATO partners about their military commitments and offered no explicit endorsement for the collective defense agreement at the core of trans-Atlantic security for decades. His stunning posture left the distinct impression that for the new American president, the nation’s long-standing obligations to allies are neither unshakable nor unbreakable. Trump did little to quell those concerns Thursday. Offering a glimpse into his apparent anxiety over how he’s viewed on the world stage, Trump argued that the same countries practically begging him to stay in the Paris accord were in fact mocking the United States’ participation. Indeed, Trump’s supporters cheered the decision, which marked the fulfillment both of his campaign promise to scrap the climate accord and his broader pledge to put American interests above all else. As a candidate, he vigorously accused President Barack Obama of capitulating to other nations in negotiations not only on the Paris pact, but also multi-country trade deals and the agreement to curb Iran’s nuclear ambitions. Trump’s record of holding to those promises is mixed: He moved swiftly to withdraw from the sweeping Pacific Rim trade pact the Obama administration negotiated, but has signaled to other nations that he plans to stay in the nuclear deal so long as Iran lives up to its obligations. To be sure, Trump is hardly the first American president to turn his back on a predecessor’s international agreement. President George W. Bush provoked similar anger from European allies when he decided not to implement the 1997 Kyoto climate change treaty, which was ratified by 140 nations. Bush made a similar argument to the one outlined by Trump Thursday, saying it put the U.S. at a disadvantage compared with major polluters like China and India. Still, Bush made the broad and public case for U.S. leadership in international cooperation, even as his policies in Iraq and Afghanistan frayed some American alliances. Since the election, administration officials have labored to explain that Trump does not intend to insulate the U.S. from the rest of the world or leave allies in a lurch. White House advisers point to Trump’s decision to renegotiate, rather than scrap, the North American Free Trade Agreement with Canada and Mexico as a sign that the president isn’t recoiling from all of America’s commitments. Trump left open the prospect that he’ll ultimately take a similar approach to the Paris pact, announcing Thursday that while the U.S. will immediately stop complying with the standards, his administration will begin negotiations to seek a better deal. It’s unclear why the U.S. would need to start such negotiations given that the climate agreement gave each country the ability to set its own targets for reducing greenhouse gas emissions. The European nations that pushed for Trump to stay in the deal appear to be in little mood to help the president take credit for a getting a better deal. France, Germany and Italy quickly issued a joint statement Thursday saying the Paris climate accord can’t be renegotiated. And supporters of the agreement in the U.S., which was painstakingly negotiated under the Obama administration, argued that even if that was possible, the damage to America’s reputation had already been done. “The rest of the world will question whether the United States can be trusted,” said Gina McCarthy, who served as Environmental Protection Agency administrator under President Barack Obama. Trump announced the withdrawal the same day he pulled back from another campaign promise: to move the U.S. Embassy in Israel to Jerusalem. While Trump ultimately sided with Arab leaders who’d implored him not to move the embassy, on the climate deal he seemed indifferent to similarly aggressive lobbying from America’s closest partners in Europe. “If you’re sitting in Riyadh or Amman or Cairo, the president of the United States has just bowed to your concerns to a much greater degree than he has bowed to the concerns of Paris, Berlin and other traditional allies on an issue of global impact,” said Robert Satloff, who runs the Washington Institute for Near East Policy. AP writers Josh Lederman and Matthew Daly contributed to this report.